. 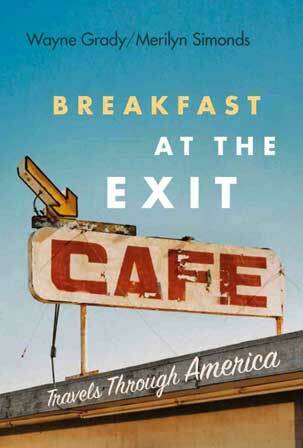 Breakfast at the Exit Café | Reviews & Interviews . Between the lines of travel narrative they provide potted but interesting histories of places, musings on stuff they buy and the restaurants they eat in, and analysis of the politics and culture of regions....They steadfastly avoided staying in chain motels and dining in chain restaurants, in order to escape homogenization and capture local colour....Swaths of the American South, in particular, stirred their intellects to astute reflections on its past, near past and present. Rather than proceed with a conventional co-authoring, they take turns, each penning half of the short sections in each of the book's 14 chapters. It's an attractive choice. As they barrel along interstates and winding highways, Grady's smouldering distrust and apparent dislike of the U.S. is literally shoulder-to-shoulder with Simonds's quizzicality and eye for offbeat detail.